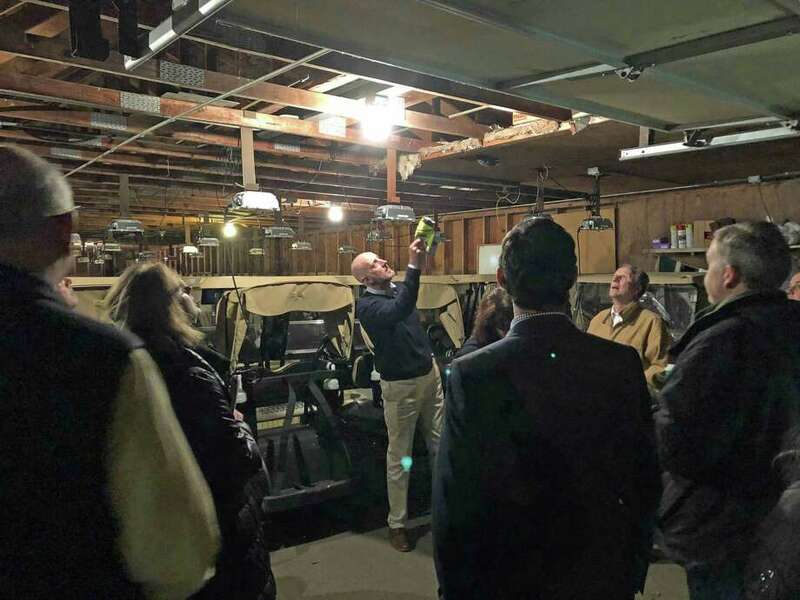 Craig Curley, chairman of the Clubhouse Building Committee Members, gives the Board of Finance a tour of the clubhouse. FAIRFIELD — The town is getting a new golf clubhouse and shovels could break ground at the end of this year, if all goes according to plan. Craig Curley, chairman of the H. Smith Richardson Golf Clubhouse Committee Building, said he was pleased with the Representative Town Meeting’s approval of the $7 million bonding resolution Monday night. “The building committee has put much work and effort into pulling together this project and I felt like we had listened to the town bodies over the course of the last 11 months of what was important,” Curley said. Though the RTM approved the bonding resolution, the decision was not unanimous. Eight members voted in opposition to the golf clubhouse project, claiming it was too expensive. Of the 29 RTM members who voted in favor, some said it was time the project got underway. The original bonding resolution proposed to the Board of Selectmen in early January was $7.3 million but the board, during its review, opted to take out $280,000 allocated for paving and site work, an amount that will form part of the Department of Public Works budget for a future fiscal year. Joe Michelangelo, director of public works, said this was due to the timeline of the project. “Because the paving will be on the tail end of the project, it may be past July 1, 2020. That means the paving will need to be paid from the Fiscal Year 2021 budget, not the Fiscal Year 2020 budget that we will be discussing and approving this spring,” Michelangelo said. The Board of Finance approved the reduced $7,020,000 bond, with one dissenting vote, Jan. 8. Now fully approved by the funding bodies, the project continues into the next phase: planning and zoning approvals, demolition of the current building and bidding. If all goes according to plan, Curley said, the project will break ground sometime in late November or December after the 2019 golf season has concluded.